Norwich Cheer Advances to Sectionals! Norwich Cheerleading placed 4th in Division II at the STAC Cheerleading Championship this past weekend! 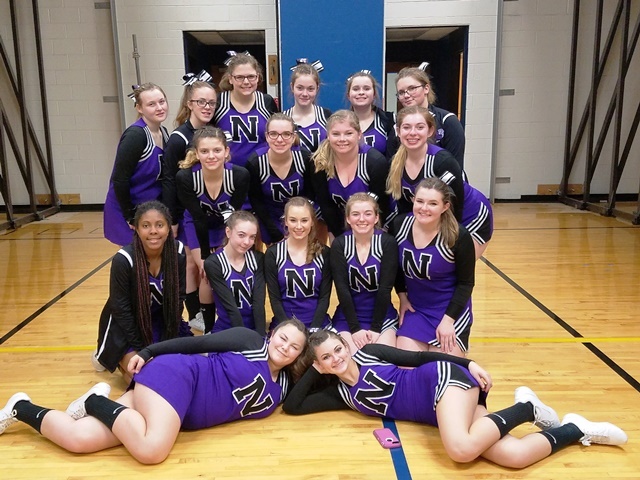 This placement allowed the team to advance to the Section IV Cheerleading Competition - that will be held this Saturday, February 24th at Union Endicott High School. This is the first time Norwich Cheerleading has EVER advanced to Sectionals!! Congrats ladies! Norwich Cheerleaders take 3rd Place at Small Town Throwdown! 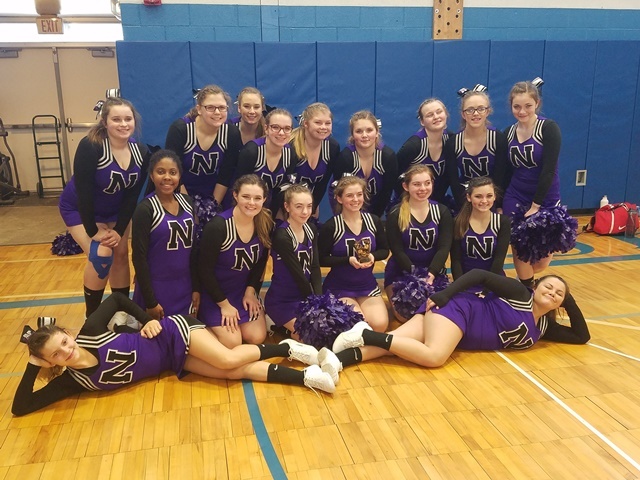 Congratulations to the Norwich Varsity CHeerleading team, for taking home 3rd place out of 10 teams at the Small Town Throwdown, hosted by Schoharie HS!! The point spread between 1st, 2nd and 3rd was only 0.4 points!! We're incredibly proud of these ladies! Congratulations to Natalie for winning the competition's Jump Off! Shelby & Karissa wre selected at UCA Cheerleading Camp at Brant Lake as All American Cheerleaders! They had to tryout in front of over 100 camp participants, performing different cheerleading skills. Only 15 total cheerleaders were awarded this honor at our cheer camp. We would also like to recognize Amber Tierney, Mya Loughren, Kalliann Harrison and Brianna Kempf for also trying out for All American, and representing the Norwich Cheerleading program. Congrats ladies! Four of our Norwich cheerleaders were recognized at UCA Cheerleading Camp at Brant Lake as Seniors, for their dedication and leadership within our cheerleading program. They have been given the opportunity to travel to Orlando, FL where they will join over 800 high school cheerleaders and dancers from across the country. They will be performing in the Varsity Spirit Spectacular at Walt Disney World’s Magic Kingdom. The four girls have a combined goal of raising $5,000 to get to their Disney World destination. There will be several fundraisers set up to help the four seniors - so please be on the lookout and support these outstanding young women! Please see coach Marie DeSarro if you’re interested in donating to the senior cheerleaders. Thank you Shelby, Kalliann, Karissa and Brianna for representing our Norwich Cheerleading team, your school and your community! Upcoming Fundraisers for our Seniors going to Disney! 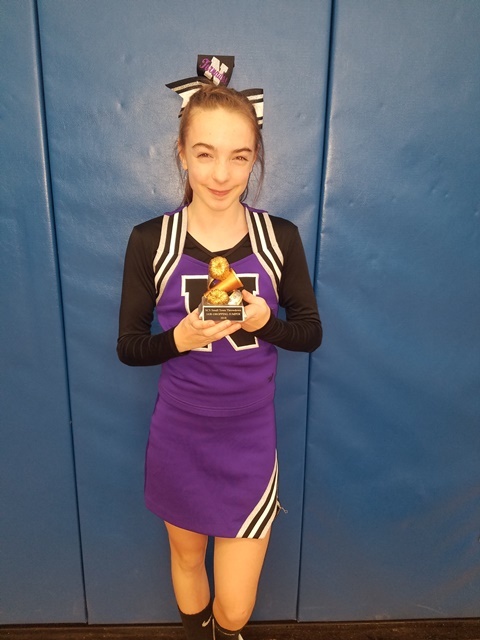 Shelby was recently selected at UCA Cheer Camp at Brant Lake as an All American Cheerleader! She had to try out in front of over 200 camp participants, performing a jump, cheer and dance. As an All American, she now has the opportunity to travel to London to participate in a week-long event including a special New Year's Day parade! Shelby has decided to raise funds towards this trip... which happens in December of 2015! She has to raise approximately $5,000 by mid-October... so please see Coach DeSarro if interested in donating towards this amazing opportunity! We had 6 cheerleaders go through the tryout process this summer at camp - Aislinn, Cassidy, Samantha, Shelby, Karissa and Mya. The hard work they put in over the course of a 2-day period was something to be VERY proud of. Each of them did an outstanding job! 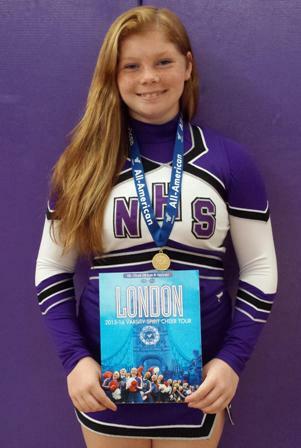 The Norwich Cheerleading program is so proud of all six of our cheerleaders for representing our squad at camp - and we look forward to having Shelby not only represent our team, but our school and community in London as an All American Cheerleader! Sam and Olivia were recently selected at UCA Cheer Camp at Brant Lake as All American Cheerleaders! They had to try out in front of over 200 camp participants, performing a jump, cheer and dance. As an All American, they now have the opportunity to travel to London to participate in a week-long event including a special New Year's Day parade! As a Senior at NHS, Olivia has decided to raise funds towards this trip... which happens at the end of this year! She has to raise approximately $5,000 by mid-October... so please see Coach DeSarro if interested in donating towards this amazing opportunity! The Norwich Cheerleading program is so proud of both Sam and Olivia for representing our squad, school and community as All American Cheerleaders! The Varsity Cheerleaders at Norwich HS were given the Outstanding Achievement award by the Universal Cheerleaders Association (UCA). Annually, teams from across the country submit a binder to UCA which includes recommendations from school administrators and community members, write-ups and pictures of community service projects they have participated in, and explanations of how their team promotes spirit in both their schools and community. The award recognizes the top all-around programs in the country. When choosing a winner, UCA looks for teams that exemplify community service, outstanding athletic support, spirit raising activities, and high academic standards. The NHS Cheer Team placed in the top 15 schools across the country by receiving this award. 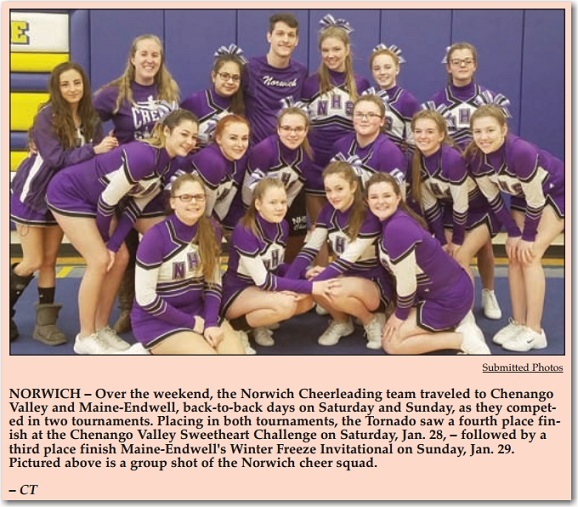 The Norwich HS Cheerleading team would like to thank Helen Gregory of the American Cancer Society, Victoria Mitchell of the Chenango Co. United Way, The Southern Tier Alzheimer’s Association, Mayor Joseph Mauriano, Coordinator of Athletic Events Joe Downey, and the honorable Howie Sullivan for writing such glowing recommendations. We are putting together a cheerleading alumni database and are looking for YOU! If you cheered or coached at least one full season at Norwich High School - on JV or Varsity - we need your information! What will it be used for? We are looking to our alumni to continue the support of our long-standing program. At this time, we are talking about sending donation letters (every 5 years), newsletters to keep you updated, and will also notify you if we have an upcoming fundraiser! No worries - your information will not be passed out to others. And the updates will only be once a month, or right before an upcoming fundraiser. We may also try to put together an NHS Cheerleading Alumni get-together! Look forward to hearing from all alumni! !